Is the Golden Retriever right for you? Find your perfect match now! Golden Retrievers are some of America's favorite dogs — they always rank high among popular breeds. And it's easy to see why: they're intelligent, versatile, cheerful, and dutiful. First bred as bird retrievers by a man named Lord Tweedmouth (no, seriously), today these dogs just might be the ideal family pet. Originally from Scotland, this large-sized and medium-energy breed can grow to between 55-75 pounds and lives an average of 10-13 years. The breed is recognized by the American Kennel Club and classified as a member of the Sporting group. WHAT IS A GOLDEN RETRIEVER'S PERSONALITY LIKE? Did we mention this is a great family dog? Golden Retrievers are playful, affectionate, smart, friendly, and fun. They also have good breath—for a dog. Golden Retrievers seldom meet a dog, cat, hamster, squirrel, stranger, or kid they don't immediately like. The household cat will just have to establish that she's the boss and, as always, it's best to monitor any dog with other pets and kids. They're often especially good with children. WHAT IS GOLDEN RETRIEVER BEHAVIOR LIKE? This is an active breed, to be sure. Like many retrievers, the Golden loves to swim — and its webbed feet help it move through the water with ease. Walks, jogs, romps, and games are always welcome. They'll also bring back a ball or a stick as many times as you care to throw one. Or at least they'll want to — Golden Retrievers have a lot of energy, but they also tire quickly. Once they've tuckered themselves out, they're happy to lay at your feet. They're somewhat alert but not very protective. They'll only discourage burglars who are really uncomfortable with public displays of affection. HOW EASY IS IT TO TRAIN A GOLDEN RETRIEVER? Golden Retrievers are very accommodating to chosen people and obedient by nature. This breed is eager to please their families and often top dog in obedience competitions. They respond well to retrieving and food rewards. Training will help keep their bright minds and busy bodies active and healthy. They can be a bit chewy, so be sure to start training early to discourage biting and destructive behaviors. HOW MUCH DO GOLDEN RETRIEVERS SHED AND WHAT ARE THEIR GROOMING NEEDS? 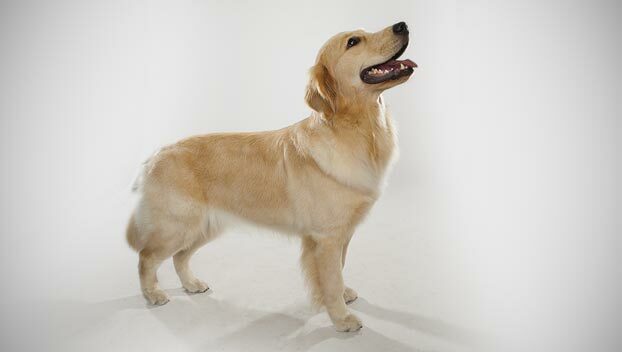 A Golden Retriever's thick, medium-length double coat is dense and water-repellant. Their hair can be straight or wavy. Your Golden Retriever will need regular grooming to prevent knotting and matting of those gorgeous locks. Plan on brushing your Golden about two times a week. They're moderate, seasonal shedders. WHAT HEALTH PROBLEMS DO GOLDEN RETRIEVERS HAVE? 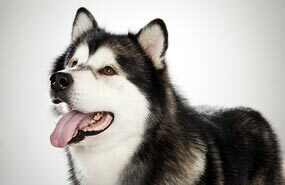 This breed has a higher than average incidence of cancer. Some are prone to obesity, so be mindful about meals and snacks. Like many large dogs, Golden Retrievers are also susceptible to hip dysplasia. Feeding your baby Golden a growth food for large-breed puppies will slow their rate of growth but not diminish their adult stature which may help prevent or reduce the impact of adult-onset hip dysplasia. ARE GOLDEN RETRIEVERS GOOD FOR PEOPLE WITH ALLERGIES? The American Kennel Club doesn't list Golden Retrievers among its breeds recommended for allergy sufferers. You can reduce your furry friend's impact on your allergies with frequent baths and brushings to reduce loose hairs and allergy-aggravating proteins in your pet's dander. Use a damp cloth to wipe off your dog after playing outside. Smaller dogs have less surface area, so they produce comparatively less dander than larger breeds — definitely something to keep in mind with a dog as large as an Golden Retriever! Remember that no breed is 100% hypoallergenic, and any breed can aggravate allergies. WHAT'S A GOLDEN RETRIEVER'S BEST DAY? Walking. Eating. Meeting the neighbors. Playing fetch. It's doesn't matter because everything is the best as long as it's on the go. SHOULD I ADOPT A GOLDEN RETRIEVER? Not much bothers a Golden Retriever: they often love everybody, and as far as they're concerned, whatever they're doing at any given moment is the very best thing any dog has ever done in the history of the world. They're also very adaptable to their environment; with enough exercise, a Golden could make a fine apartment dog. This pup likes the cold but doesn't mind the heat either. If you can keep them groomed, entertained and active, it's hard to imagine a happier or more loving canine companion. Have you decided that a Golden Retriever is the perfect dog for you? Why not be your new best friend's hero and adopt a rescue! Be sure to check out our article on what to expect when you're adopting a dog or cat.